Steve Elkington visits Devens, MA to meet Rounds FORE Warriors, group of incredible men that play 50 courses in 25 days for the families of fallen military men. SMACKDOWN also takes place at Red Tail Golf Club, built on former Fort Devens. [MUSIC PLAYING] ANNOUNCER: On this episode of "Secret Golf," we tee it up in the land of the free on an old military base that now looks quite different. JIM PAVLIK: And guys have actually had tears and wept about what this has turned into now after 100 years of history. ANNOUNCER: We meet four patriots on a mission to serve our country's veterans through the game of golf. BOB NICOLL: We've had some incredible experiences. We've played in hail at the Air Force Academy. We've played in 90-degree weather. We're playing on a gorgeous day here in Massachusetts. ANNOUNCER: And our host gets into an epic smackdown battle with two of our nation's finest. STEVE ELKINGTON: Oh, Barrie, what are you doing? I thought I was going to have a win. ANNOUNCER: "Secret Golf" is rolling your way. THEME SONG: --the big show, going looking for the heart and soul. THEME SONG: We're rolling till the wheels fall off. It's "Secret Golf." Shh. It's a secret. -Their initiative is very focused. Almost 100% of their earnings go towards their focus points. -We have two veterans programs that mean a lot to us. One is Final Honors. -And that is to help the burial of our veterans with "Taps" so that they're buried with honor. The other one is Special Operations Warrior Foundation. That one came about in 1980 when a helicopter went down, and the men didn't come home. -Didn't come home and left their children without a father. And it comes about to help their children get an education. -Four golfers set off to conquer 50 states and 900 holes in 600 hours and 15,000 miles. Greeted with top honors at every stop. The warrior foursome began every round with a ceremonial tee shot inaugurated by a veteran they honored along their journey of a lifetime. -(SINGING) Oh, say can you see by the dawn's early light. ANNOUNCER: Embarking on a colossal adventure that spanned the country. -This is the official opening shot of Rounds for Warriors here at the beautiful Ko'olau Golf Course in Kaneohe, Hawaii. ANNOUNCER: Their impressive scramble scorecard proved these four golfers were not going to let anything stop them from reaching their goal. -We've had some incredible experiences. We've played in hail at the Air Force Academy. We've played in 90-degree weather. We're playing on a gorgeous day here in Massachusetts. And we've had a few nicks along the way. But for the most part, we're holding up very well. -Well, it's fantastic guys, and look, I know you've got a big schedule today. You're playing here today. And I'm going to slip in and let our crews see a quick three holes with you guys on your way through. -That'd be fantastic. Thank you very much. ANNOUNCER: But who would have thought this fearsome foursome would have picked up an extra lad at stop number 33? STEVE ELKINGTON: I'm inspired by you guys. Can you guys come with me on the tour? BARRIE FARNSWORTH: The dedication they must have to do this and the stamina to do this in two courses a day in 25 days is unbelievable how many hours they spend traveling in a car or on a plane, or how much sleep they get. It's pretty wild. -We can't birdie every hole in Massachusetts unless we birdie the first. ANNOUNCER: The Life is for Giving Foundation is only one of the many organizations that have set off on a purposeful mission to help the families of fallen warriors. And that is why it is so important to help these driven foundations go the extra mile to raise awareness and monies for our veterans. -They're very emotional about it. They all have attachments to those people. They've all been in the service themselves but one. And they want awareness to that plight. BOB NICOLL: People donate. 100% of that goes towards the charities. -With programs like Rounds for Warriors, there's no wonder why these four men jumped on board that epic adventure to raise support for our most treasured. -For me, my dad was a veteran. He was a POW. And to see these guys come out and to go off to play 50 golf courses in 25 days throughout the United States, that's a sacrifice. That's a physical sacrifice for them to do it and to raise money for not only the wounded people, for those that need children with education that go on from there. It's awesome. I could cry right now when I just think about what happened here today. Fort Devens started in 1917 when we knew we were going to get into World War I. We needed to train some troops. And we did World War II with a large contingency as well as Korea, Vietnam, and ended up here with some soldiers out of Iraq. It's such a hollow piece of ground that every day you walk here and come here, we have soldiers that come back all the time and say, oh, my, I lived on your eighth green. This is so exciting, and they actually come back and guys have actually had tears and wept about what this has turned into now after 100 years of history. -We are in the middle of a little bit of a military appreciation mode today. We have already played a little match with the Rounds of Warriors that are on their way to doing 50 courses in 25 days. And we are on one of the most incredible golf courses built right on top of Fort Devens. And I've got two military men-- Mike, Barrie, both ex-military, both work here. BARRIE FARNSWORTH: My dad worked here on the base for almost 40 years. He came here at the end of World War II. My wife and I walked the course every week for almost two years when they were building it. And then as soon as they opened, we played here, and I got a job here about eight years ago. -This underneath here, this was Fort Devens. And what did Fort Devens represent? I mean, what do you do at Fort Devens back in the day? -Fort Devens was a training base for military troops anywhere from cavalry, to armored, intelligence. The Green Berets were here. STEVE ELKINGTON: And then we decided we're not going to do that. We are going to put a golf course right over the top of it. We're going to have a little match between military versus civilian. You two guys are going to be playing against me today on the Secret Smackdown, Massachusetts style. OK, Barrie, what do we got here? We've got 160, 170-ish? BARRIE FARNSWORTH: About 170 back to the pin. The hole is called Deception. And that's because it always plays pretty much the full distance. -Nice Barrie, up you go. STEVE ELKINGTON: OK, well done. As you know, we find passion, golf passion everywhere we go. And here's a little passion. Mike had a hole-in-one on this hole about four years ago. -Six iron from-- it was about 165, 160. -Where was the pin? Front, middle, or back? -Middle. It was the white pin in the middle. -We got the red-tail tattoo on the leg. Now that, ladies and gentlemen, is passion. MICHAEL BRENNAN: Visually challenging. It's also technically demanding. So it's fun to stick a pretty nice shot on the front of the green and watch it roll up and plunk. It was very rewarding very, very nice. STEVE ELKINGTON: Wow! Great shot. BARRIE FARNSWORTH: Good ball, Mike. Sit right there. MICHAEL BRENNAN: There's our mascot, red-tail hawk. STEVE ELKINGTON: Is that just supposed to happen with the tattoo, and the bird, and the name of the course? STEVE ELKINGTON: I hit it nice. BARRIE FARNSWORTH: Yes, you did. -OK, thank you. Beautiful par three, just gorgeous par three down a hill, framed up by two big oaks. The name of that hole is Deception. It's so pretty. It looks downhill. It probably is a bit down hill. But somehow, it doesn't play downhill. I only had 170, and I didn't get my six iron back to the flag. OK, I've got my three. 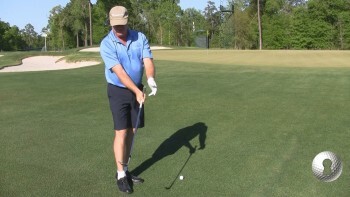 BARRIE FARNSWORTH: Mike's ball was at the back of the green. So we were able to use his. We gave Steve his, because he was close. And we tried putting from ours, but we came up a little. It went by a little bit. -You know what? I think I'm going to have to get you guys to put one of these. Which one do you want to pick? They get a little bit-- maybe a little unraveled early, just get one too far by, but they knock in full footer. Barrie does. And so we tie it up. -Oh, look at that man, putt. Good putt, Barrie. -Good hole. Good hole. Sorry, guys, it's been a while since I've had a win. I haven't had one in this century. This was an old Army barracks. And there was some very interesting things to see, particularly around the back nine. MICHAEL BRENNAN: Foxhole here that the soldiers were trained to dig. STEVE ELKINGTON: It's built on top of a old Army barracks. That's a foxhole. MICHAEL BRENNAN: That's the remains of a foxhole that was used for training here. STEVE ELKINGTON: So am I allowed to go in there? MICHAEL BRENNAN: You certainly are. -So when someone says, I'd like to be in a foxhole with that guy, this is what you're talking about? MICHAEL BRENNAN: That's about it. -I don't think I really want to be in a foxhole, ever, with anyone. Sense of nostalgia, history, we civilians don't get to really visit these kind of things very often. And I'm really glad they've left them here on this course for us to, you know, have a look. OK gentlemen, we had an even hole on the first hole. You have chosen number 17 at here beautiful Red Tail. Why did we pick this hole, Barrie? -OK, got it. Beauty, you curved it around the fairway. I like it. Nice shot. -Fun hole to play, different from most of the other holes, because it doesn't look like any of the other holes. But it's the kind of a hole where the fairway is totally isolated by the surrounding bunkers and sand. And because it's a dogleg right, you get a chance to challenge it as much as you feel like challenging it. -OK, that's fine, I think. What have we got here, Barrie. BARRIE FARNSWORTH: This is one of those ammunition bunkers we were telling you about. STEVE ELKINGTON: Look at those doors. BARRIE FARNSWORTH: Those are big, about 6-inch thick steel doors. And they would lock them with the ammunition in there so if there were an explosion, it wouldn't travel out too far. STEVE ELKINGTON: And what a treat that was. That was interesting, because if you took the door off, and you lifted the door up in the air, and dropped on your car, and squashed it down to an inch high, I mean, that's how heavy the door is. The door is that thick of solid metal. Secret Golf, Secret Golf, Secret Gold, Secret Golf, Secret Golf, Secret Golf. It's come out super-low. Is there a chance it might roll all the way? Oh, look at this, local knowledge. OK. Oh, that was solid. Mike, good swing, Mike. STEVE ELKINGTON: Look at this. Look, look, look. Did you make it? STEVE ELKINGTON: Good shot. I said later that they were the greatest ham and egg team in the history of golf. And it wasn't really sort of a true smackdown. It's hard to smack talk two guys from the military. I mean, what do you do? How do you intimidate a guy who's been shot it. You can't do it. That could be all right. MICHAEL BRENNAN: Back it came, said goodbye to my ball as it was going by me and ended up a foot? Something like that from the hole. -Did you see the pro spin? -I showed him a bit of pro trick. I hit one up there and spun it way back. -You want me to take it? -Keep the coin in your pocket. -Oh, what a deadly looking putt. Oh, yeah, well done. -Well done, good three. So I've never played on a golf course that had an ammunition bunker. -I'll bet not. So I thought today's instructional piece we could do on the long bunker shot. So here's what I do, and the first thing I do when I come into a longer bunker shot, I don't want to open the club too much, because I don't need that much loft. I pretend that I'm on the grass with a wide stance. The reason I do that is on the grass, I'm always going to set my body to where I'm going to hit it clean. Agreed? -Then I scoot back a half inch. So now, everything being equal, I should be going to hit it fat half inch. And the key to the long bunker shot is we don't want to be too dig, right? We don't want to dig it too much. The third thing I do is I make my swing real wide on both sides, because I don't want to make it v-shaped and go into the sand. Makes sense, right? -So I come in. That's where I'd be on the sand or on the grass, wiggle back a half inch, and I make my swing wide. Don't go in, please. That would break everything. -And that is how you hit the long bunker shot. -A one in a million. I'm going up to my first observation tower in my life. JIM PAVLIK: Watching Steve go up into the tower on 18, it was like somebody was up there 24/7 every day to watch out over this land and keep us Americans safe. -You can imagine when you go up there, you imagine looking down. Of course, the trees are up now, but you can imagine back in the day that was an area that someone had to guard. Hey, you, get away from there, you know, or blow the siren. OK, guys, you have the rest of the afternoon off. We are going to play golf. Now, the match is tied. We both got a birdie on the last hole. We've chosen the 18th hole here at Red Tail. Why have we chosen 18? BARRIE FARNSWORTH: This hole is called Temptation. MICHAEL BRENNAN: It's a tempting hole, because with a good drive, it puts you in just that tempting zone to go for the green over the water in two. -Are you going to take advantage of me today? -Ooh, that remains to be seen. -OK. All right, let's go. Wow, what's wrong with that one? That's a good one, Barrie. -Well done. So the 18th hole was called Temptation, which meant the architect named that, because it was par five that you could roast it off the tea, down a hill, get some distance, and possibly be tempted to go for the green in two. I'm going to give this the full ammunition bunker blast right here. So I was feeling pretty tempted. Is that perfect? BARRIE FARNSWORTH: We knew that Elk would hit a good long ball and be going for the green in two. We knew that we could not get there in two. So we'd be doing the layup. -That's perfect. That's going to kick right into the honey hole right there, right? -Yep. That should do it. BARRIE FARNSWORTH: Mike then made a great second shot down to our layup position. Perfect, right where we wanted to be. STEVE ELKINGTON: Boy I hit it right where I wanted to. MICHAEL BRENNAN: You sure did. BARRIE FARNSWORTH: Yes, you sure did. -But I was foiled by the ham and egg team again by Barrie now out of nowhere hits it like that with a wedge. MICHAEL BRENNAN: Yeah, Barrie got up and stuck one. He stuck one real good. That put a little pressure on Elk's putt, which was cool. You got to apply a little bit of pressure to this man. STEVE ELKINGTON: And I knew that if I didn't make my eagle, we were going to probably be tied, because they were going to knock that one in. And exactly, that's what happened. That a boy. -Great tie. The Smackdown was tied, which I think today was suitable, because the whole day was about the military, the appreciation of the military. It's an honor for me to pick up into this little small piece of your guys' mission. How can we get involved? How can people understand more about what your mission is? -Well, Rounds for Warriors has a website. That's www.roundsforewarriors.com. -It's about veterans. We owe them so much. The majority of our team is set up with veterans and stuff. So it means a lot to us. And we just want people to get out there at any level that you can help a veteran, whatever it is, whatever program you choose to do, donate. Spend time with them. Just reach out and say hello to them. That little thing could change somebody's life more than anybody knows. And that's kind of what we're wanting to do is to let people know, you know what? We owe veterans what we have today. We couldn't be doing it without you. -Well, I want to say on behalf of our "Secret Golf" audience, you're going to have a new big bunch of people that you will be following this program. And thank you for letting me be a little piece of your wonderful trip. -The honors is ours. The honor is ours. -Mutual. Thank you very much. I met a group of guys who are going around the country, and they are using golf to help raise money for fallen soldiers. I learned that a whole fort underground is fine to build a golf course on. It's like this. MICHAEL BRENNAN: You don't want to be in the foxhole now. -I got to visit with some pretty cool Army guys, Navy guys, that almost put a thrashing on me. Oh, look at that man putt. Good putt, Barrie. -Be careful when you meet those old Army, Navy guys. They are ready for you. -On another episode of "Secret Golf," Elk heads to America's dairy land to visit an old friend and see how comic cards turned an unlikely town into a golfing mecca. STEVE ELKINGTON: Herb is an amazing businessman. He's done so much for this community up here. He built these four golf courses, five-star hotels. It is a destination that is just not believable. -He'll also discover the passion that crafted an old airfield into one of the most spectacular golf courses in the world. -To a lot of us like me, it's a bit of an enigma. It's like what's that doing here? -He'll tee it up with the locals. STEVE ELKINGTON: Oh, look at the big cheese. GOLFER: I think it went in, Steve. I think it went in. -That's going to be very close. -And sample the state's most famous export. STEVE ELKINGTON: That's cheese that's been soaked in red wine. STEVE ELKINGTON: That's two things I like. Some of the people that we brought here this week, they never thought they'd ever come to Wisconsin for anything. And now, they are booking their tickets. ANNOUNCER: All that and more when "Secret Golf" visits Whistling Straits. ANNOUNCER: "Secret Golf" with Steve Elkington has been a presentation of "Secret Golf" incorporated.